A town in Northern Ireland with a population of just 21,000 has the fastest runners in the UK, according to data collected by a fitness app. Strava's annual report showed the average speed of athletes using the GPS mapping app in Omagh, County Tyrone, was 5.03 min/km. Omagh's athletes ran away with the title, beating those in London by two seconds. Next, came NI once again with runners in Banbridge, County Down third. Strava, which has tens of millions of users worldwide analysed 24.7m runs and 31m bike rides logged across the UK in 2017. 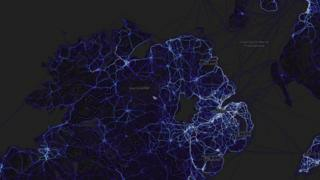 A Strava spokesperson would not reveal the exact number of people using the app in specific areas, but said the data suggested users in Northern Ireland were above average in ability and commitment. Analysts suggest a smaller number of more advanced runners using the app in Omagh could boost the area's performance in Strava's end-of-year league tables. The data showed Northern Ireland had some of the "most committed athletes in the world", said Strava's Gareth Mills. Collectively, they ran more than 3m kms, and cycled nearly 21m kms, in 2017. He said the running data suggested "a diverse and expanding running community". In the GPS mapping app's analysis of the UK's cycling habits, Northern Ireland also claimed the crown for the cyclists who pedalled furthest, most often. Ballymena, Magherafelt and Armagh took first, second and third place for the "longest average ride", the report said. Ballymena also came second in the fastest cyclists category, behind Ceredigion in Wales, with a speed of 33.2 km per hour. "With an average ride of 51km, Ballymena must have some incredibly committed cyclists - this is 60% further than the UK average ride," said Mr Mills. Paul Murdoch, the chairman of Ballymena Road Cycling Club, said: "We must be a competitive bunch, we've always done consistently well in competitions and once upon a time we were one of the biggest clubs in the UK. "Other clubs always joke that we train too hard. "Cycling has really grown in popularity in recent years, and and Ballymena was lucky to have a good club for people to join when that happened."